It has blueberries. It has cinnamon. It has generously-sized pieces of challah bread. Oh, and it’s so easily prepared the day before. 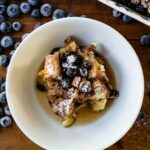 Let me introduce to your newest brunch friend: overnight blueberry French toast! Brunch is everywhere and that’s no surprise. Obviously, it’s because brunch food is, in one word: amazing. I don’t know about you, but I love a hearty breakfast. Sadly, weekdays don’t have the time they deserve for that all-important morning meal. But honestly, when I’m up early, a large breakfast doesn’t even sound appetizing. By lunch, I’m busy at work and grab something light to tide me over. Or if it’s an especially hectic day, my meal consists of a bit of snacking here and there while running errands. Either way, I end up not really thinking about what I’m eating. Please tell me you’re in the same boat during your weekdays! But this all changes on the weekend: I wake up a little later than usual, and find more time to enjoy those foods I’ve been craving all week. By the time I’ve exercised and enjoyed my first cup of coffee (of many – still loving Starbucks’ Peppermint Mocha even though Christmas is in the rearview mirror), I’ve totally missed breakfast. But isn’t this why we all love brunch? It takes the best of breakfast, pairs it with the food we usually reserve for lunch and smashes the two together to create an epic meal. Going out for brunch is fun and if I’m choosing, I love to go to my local Bluebird Diner. But I’m declaring this the year of staying in and making brunch in our own kitchens! Think about it: with the right recipes, you can prepare some items beforehand while other dishes can be made the morning of. 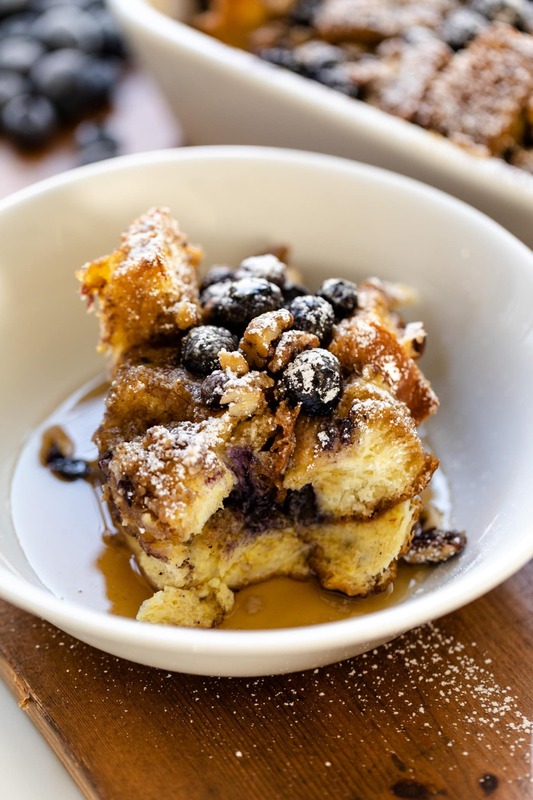 In the make-it-beforehand category is this overnight blueberry French toast. And if I’m being honest, once you make this, you’ll kind of be tempted to refrain from ever again making the traditional variety. 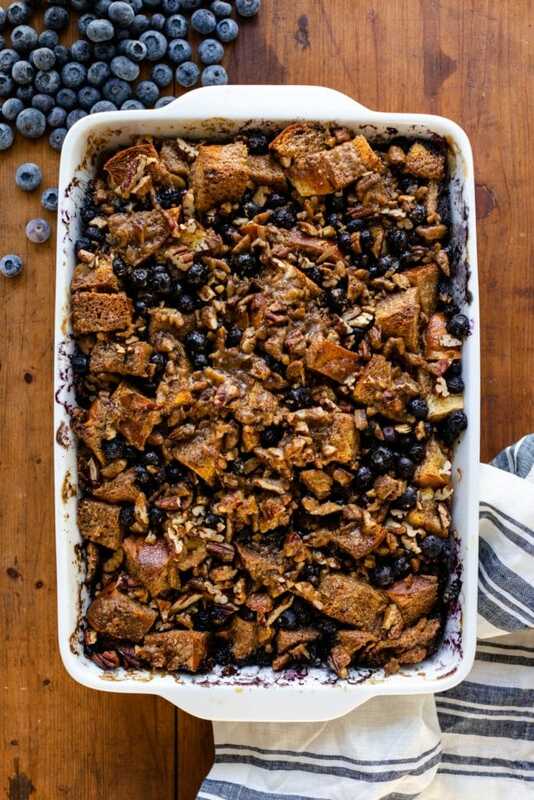 The challah bread is soaked in a custard mixture, topped with blueberries, nuts, and a brown sugar glaze. If that didn’t get your mouth watering… well, then I’m at a loss for words. I like to finish the French toast with a healthy sprinkling of powdered sugar. Ya know, just ’cause! Catchy hashtag, right? Well, it actually serves a central purpose for me. This year, it’s all about brunch-inspired recipes. Winter, spring, summer, and fall all offer seasonal specialties that are the perfect inspiration for brunch recipes. And since so much of our lives revolve around the seasons, it’s my aim to amplify these each season’s unique flavors in brunch-y recipes. Great food. <– so much better than anything in a restaurant! Great company. <– friends = love, right? Easy gathering. <– I’m all about making entertaining effortless! 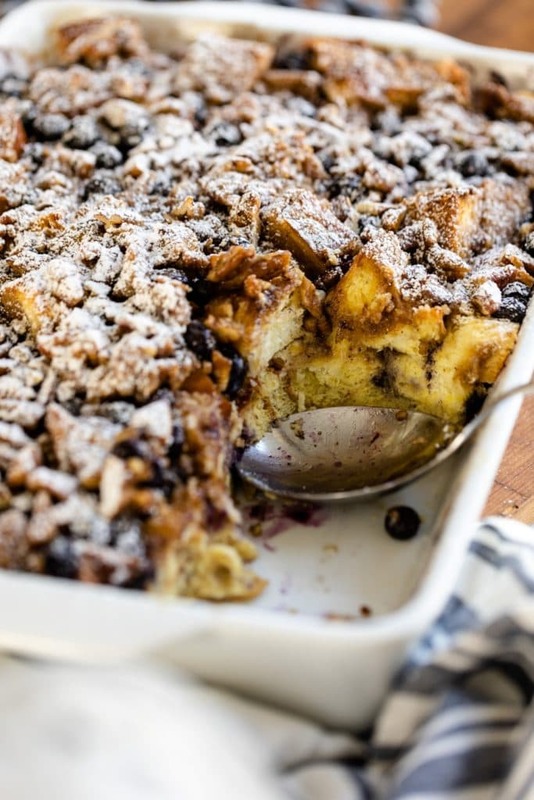 Mmmm… that challah bread is sooooo perfect for this! 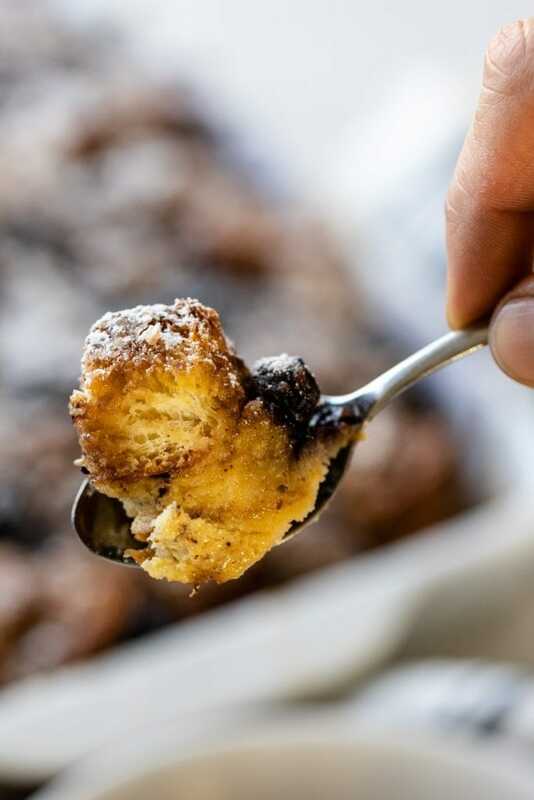 Let me know in the comments if you’re going to be making this French toast recipe. Or if you have a favorite brunch item that you’d love to see on this year’s menu, let me know as well! 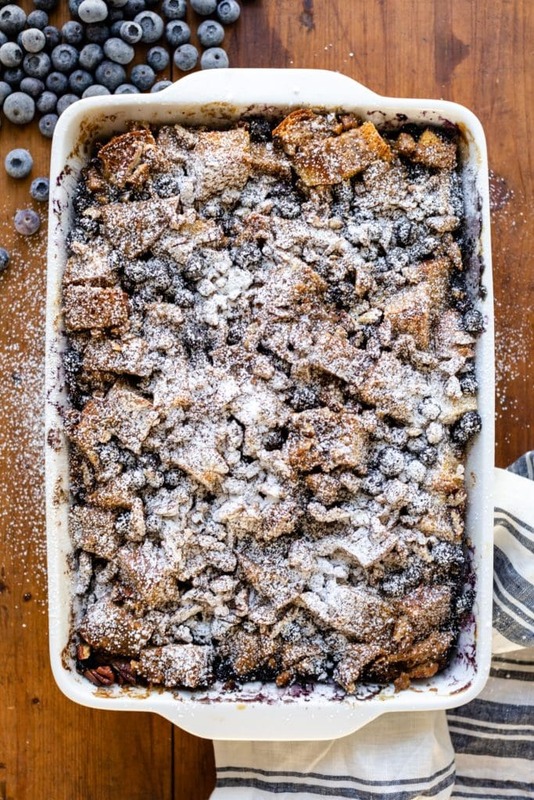 This blueberry French toast is pretty much a throw-it-together-and-let-it-go type of dish. Make this the day before and place it in the refrigerator overnight before baking in the morning! Happy brunch! Spray a 9×13 baking dish with nonstick spray. Place the cubed bread in the baking dish. To make the custard, crack eggs into a large bowl. Whisk until smooth. Add the milk, half & half, vanilla, zest, lemon juice, and cinnamon. Whisk to combine and pour over the prepared bread, ensuring to moisten each cube. Sprinkle the blueberries over the soaked bread. To make the sauce, combine the butter, brown sugar and corn syrup in a small saucepan. Place over medium-low heat. Stir until the mixture comes to a simmer and the sugar dissolves. Drizzle the sauce evenly over the prepared French toast. Cover with plastic wrap and refrigerate overnight or up to 10 hours. One hour before baking, remove French bread from the refrigerator. Remove plastic wrap and place French toast in oven. Bake until puffed and golden brown, 45-55 minutes. Remove from oven and cool for 10 minutes. Serve with powdered sugar and maple syrup.